Hi there!! The day is finally here! Candace and Michelle have been so busy creating such CUTE stamp designs! This release is so fun and can really add to so many projects! If you came from Kate you are in the right spot! If you just happened to hop on by and would love to start from the beginning start here! Cake is made from the Cricut Sweet Shoppe Cartridge! This was so much fun to make! I plan on making more in the future! Here is Mondays project using Pattern and Friendly Kisses! 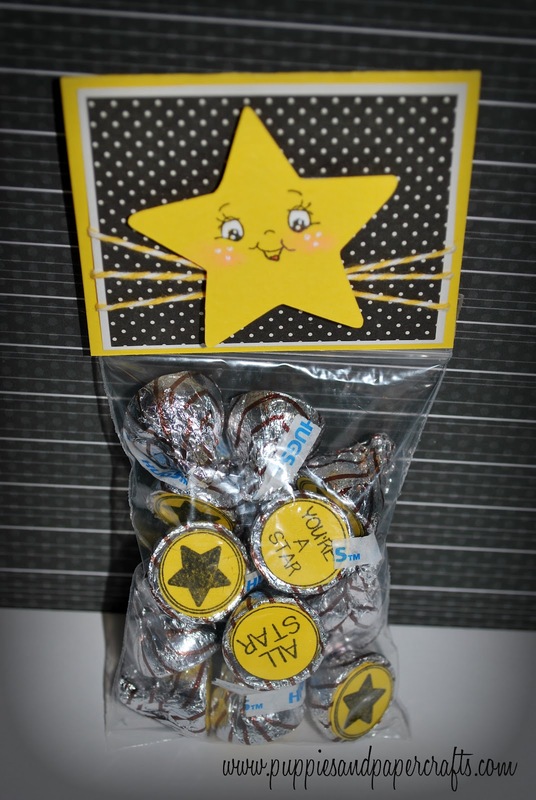 Here is Tuesdays project using the Sports Kisses! Which "Kiss" set was your favorite? What a yummy project Kim! Love the pink and brown cake! Those papers are gorgeous!! Awesome ----- too pretty to eat! Great job! Love all your projects...great cake box!!! Your projects are so cute, Kim. I love your cake favor box. Pink and brown look so yummy together. These are all so great it is ridiculous! I really like how the red and black ladybug bag stands out! So cute Kim! Love the polka dots! My favorite has to be the pattern kisses! Loving this hop! All your projects are fabulous! I can see why you will be making more of these in the future...they are FABULOUS! The cake box is just too cute but love the LadyBug too!! Love the Ladybug bag of goodies & the star bag. 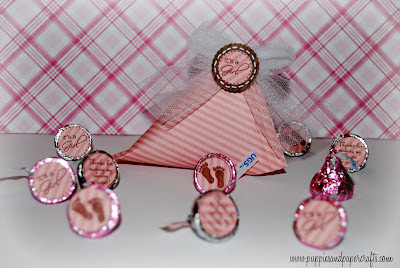 Such cute ideas, thanks for sharing! Yummy cake.Love that lady bug favor.Great job coordinating the project with candy. Love it Kim and it's my favorite chocolate too. Everything is so "sweet"!!! Great job! very cute chickie thats a whole lotta kissees !!!! I like how you used the pattern paper to create layers in the cake ! tooo cute ! awesome job all week !!! What a great job on the new stamps. Love the ladybug treats. Great projects Kim! Ooh I can't choose which set is my fav because I can use them all! Lol!! Your projects all week were so cute and awesome. Love the cake box for the hop and I love the trim. All your projects are adorable!!! Nice job Kim! My favorite was the sweet little ladybug treat bag! Thanks for sharing and for the fun hop! i love them all the cute ladybug with the red and black and the star and your cake box is super cute too! Just loving everything! Such a great job! I'm a follower now! I couldn't pick just one as my favorite...and then of course coming to your blog makes it even harder...so i just got them all! LOL Thanks enabler!! Great job! Love all the projects! 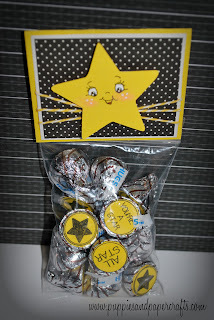 My favorite set is the Friendly kisses and the birthday kisses--so many possibilities! I love that last little kiss set!!! How cute and unique!!! Thanks! All of your projects are just to cute!!! Very original!! I like it! !